NEW YORK STATE (December 1, 2014) – Governor Andrew M. Cuomo has announced that over $500 million has been saved since 2011 thanks to innovative efforts to prevent Unemployment Insurance fraud in New York State. “These fraud-fighting reforms have helped strengthen New York’s Unemployment Insurance system for job seekers and ensure employers do not bear the burden for those who seek to game the system,” Governor Cuomo said. “This administration will continue to crack down on Unemployment Insurance fraud and make sure that these benefits only go to the New Yorkers who need them." Employers across the state contribute to New York’s Unemployment Insurance Trust Fund. When the Trust Fund is forced to pay out because of a fraudulent claim, employers have to pay more, and that means consumers pay more as well. The main technologies that the state Department of Labor uses to help prevent and detect fraud are new-hire and incarceration data cross-matching, data mining and foreign Internet Protocol (IP) address blocking. Cross-matching new-hire databases helps identify individuals who may not be eligible for Unemployment Insurance benefits because they started working again. In most cases, this cross-match immediately stops them from collecting any benefit payment, even before they receive their first paycheck. Since January 2011, new-hire cross-matching protocols have prevented $409 million in benefits from being paid out to more than 200,000 individuals. Incarcerated individuals are not eligible for benefits because they cannot meet the requirement to be available for work. Cross-matching incarceration databases halts attempts by incarcerated individuals who file for Unemployment Insurance benefits. Applications by an individual, their friends or their family members to collect on their behalf are blocked when incarceration databases are compared. By blocking more than 7,500 individuals from collecting benefits, incarceration cross-matches have saved an additional $18 million. Since June 2012, foreign IP blocking technology has prevented $97 million in benefits from being paid out to more than 40,000 individuals. When computers or mobile devices from foreign countries attempt to access the New York State Department of Labor’s system, they are blocked from claiming benefits. This prevents individuals from collecting benefits while out of the country and not available for work as required by law. Since IP blocking was implemented, the number of attempts per quarter has been reduced by nearly two-thirds. The Department also conducts sophisticated data mining to detect identity thieves who use that information to collect benefits. Agency investigators have uncovered large-scale identity theft rings that have preyed on New York and other states. In one case, state Labor Department investigations detected numerous false claims filed with stolen identities coming from Florida. Working together with Federal law enforcement, investigators found a cache of stolen identities, hundreds of credit and debit cards and evidence of fraud against numerous state benefit programs. The defendant pled guilty in Federal court last week and is awaiting sentencing. Data mining alone has prevented an estimated $10 million in illegal benefits from being paid out to nearly 700 individuals in the past three years. In addition to preventing fraud, the Department of Labor also recovers payments for benefits that were illegally collected and refers cases for prosecution. Governor Cuomo’s comprehensive Unemployment Insurance Reform measures created a stronger mechanism to prevent, detect and recover benefits that were fraudulently collected. As a national leader in fraud prevention, many of the Department of Labor’s methods have been adopted by other states. As a result of New York’s leadership in fraud prevention, the state was selected in 2012 to house the Unemployment Insurance Integrity Center of Excellence – a national collaboration of state workforce agencies, the U.S. Department of Labor and the National Association of State Workforce Agencies. The Center is a laboratory of innovation for integrity strategies in the Unemployment Insurance program, focusing particularly on the prevention detection and recovery of improper payments. These efforts will further improve system integrity in New York and in other states. To anonymously report any kind of fraud, please visit: www.labor.ny.gov/fraud. 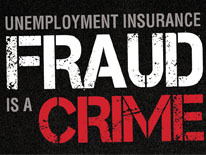 For more information on what constitutes Unemployment Insurance fraud, please call 1-888-598-2077 or visit:www.labor.ny.gov/agencyinfo/uifraud.shtm.